For many electrical engineers, the complex s-plane, where upon the plotting of Laplace transforms take place, is something very familiar. 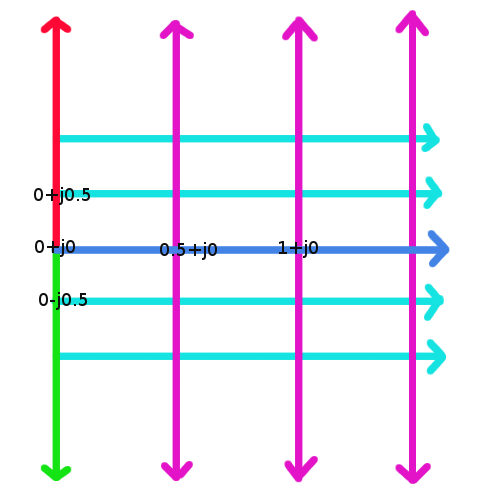 Often, it’s used to plot the poles and zeros of a transfer function, be it open or closed loop. For a feedback amplifier circuit to be stable, for example, the open loop poles must be located on the left half of the s-plane. The s-plane can be used to plot the root locus of a transfer function, something that is useful in analyzing a loop’s stability. It’s also good for plotting impedances of circuit structures or components. For example, passive devices lives entirely on the right side of the s-plane since real-life passive devices can only have positive real impedances. This last point is important and I’ll return to it later in the post. What’s less familiar to most electrical engineers is the Smith chart. In fact, some EEs I’ve talked to are absolutely mystified by the entire concept. I was too, for the subject on waveguides in undergrad was very poorly taught. I also found Wikipedia’s treatment to be wanting as well, it being a rather dense description for someone unfamiliar, or even scared, about this wonderful plotting device. 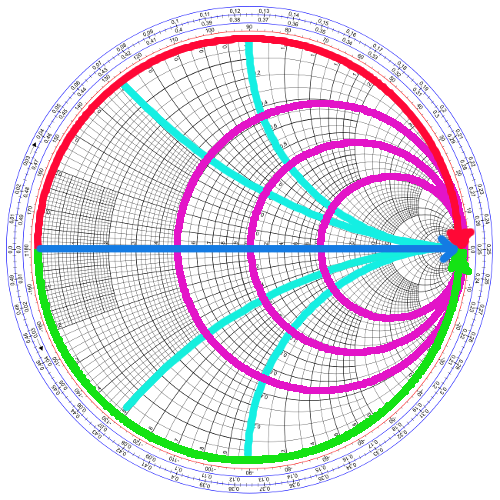 To those that have survived the years of abuse necessary to obtain an electrical engineering degree, the concept behind the Smith chart is quite straightforward; yet, I’ve rarely found a straightforward explanation for it. So to render that situation, here’s my humble attempt. RF engineers, working in the wacky world of waveguides and transmission lines, weren’t satisfied with something as uninteresting as the Cartesian coordinates of the complex s-plane. So here’s what a certain Mr. Smith did with that plane. He took the positive infinity point on the real axis and shoved it all the way down where 2+j0 would normally be on the s-plane. Then he took the plus and minus infinity points on the imaginary axis and bent them in an circular arc to join the other shoved-in infinity point at what used to be 2+j0. All the other hitherto straight lines on the right side (positive real side) of the s-plane are bent accordingly. What about the left side of the s-plane? Mr. Smith simply threw it away. After expending much effort in shrinking axes of infinite length into something finite, we end up with Mr. Smith’s invention – the famous, infamous, and eponymous Smith chart. So why just map the right half of the s-plane? Remember earlier in the post, I talked about real passive devices having only real impedances? In RF engineering, a good deal of effort is spent manipulating impedances of passive devices in order to maximize power transfer from the transmitter to the receiver. Dealing with passive impedances necessarily means dealing with the right half of the s-plane, which, as we’ve seen above, means dealing within the Smith chart circle. But what about the area outside the circle? That’s a perfectly valid region, a region of negative impedance, and a good topic for another blog post some time in the future. In short, the Smith chart is just a circular version of the entire right half of the s-plane, infinities included. That’s it. I wished someone could have explained it like this when I was still an un-jaded wide-eyed undergrad. And I hope for those of you not familiar with the Smith chart, that this was a straightforward explanation as well. If not, let me have it. Leave your comments below. Thank you. That was probably the most straight-forward explanation I’ve seen. You forgot to mention that it’s a nomogram! I would have mentioned that it’s a nomogram if I knew what a nomogram is. I do now, thanks! I wrote a post about it a very long time ago, but it still seems to be one that gets me a lot of hits. I can’t figure out if it’s because of the LOLcat or not. I remember your post (sorta); I even commented on it. Well if it made sense to a non-sparky like me, can’t be half bad!